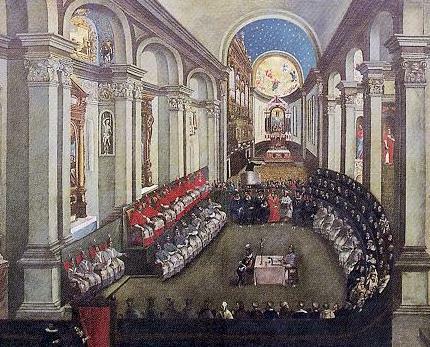 The Council of Trent, which began on this day in history, 1545, was the Catholic Church taking stock after the drama and challenges presented by Luther and the Protestant Reformation. Despite internal bickering, external dangers and a couple of lengthy interruptions in the proceedings, the council was indispensable in revitalizing – and rehabilitating – the Catholic Church in certain areas of Europe. When Martin Luther nailed his 95 theses to that church door in Germany, not everyone rallied to his cause. There were those Catholics who preferred to reform the already existing Church rather than breaking away to form a new one, which many believed was heresy. The Council conceded those in high positions in the Church had become far too worldly, that bribery was common, and the selling of indulgences was completely out of hand. Some in the Church felt these wrongs needed to be addressed, while still others saw them as “perks” of the job that they were reluctant to part with. Charles V, the Holy Roman Emperor, stressed the importance of reaching compromises with the Protestants as much as possible. One issue that had inflamed Luther and sparked the Reformation was the selling of indulgences – the practice of selling a place in Heaven to the “faithful” in exchange for donations to the Church, despite this practice being somewhat blasphemous and certainly not scriptural. Knowing that Luther’s rebellion had been largely prompted by corruption, the Council condemned the many abuses that had been commonplace in the Church, such as avarice, nepotism and sexual misconduct. The Council also dealt with matters pertaining to doctrine. Not surprisingly, it rejected almost every contemporary Protestant teaching in favor of traditional Catholic Church dogma. The Council maintained that there were seven sacraments necessary for salvation, not the two put forth by the Protestants. The Catholic belief of transubstantiation, which holds that during the Mass, the bread and wine literally are transformed into the body and blood of Jesus Christ, were re-affirmed. As far as the issue of justification, they could not support the idea of salvation by faith alone. The Council affirmed that no person could ever know for sure if he or she was justified, and that good works are an important part of entering in to Heaven. On issues pertaining to the Scriptures, the Roman Catholic Church moved even further away from the Protestants. Luther and his ilk had been translating the Bible into the languages of the common man, which opened the Bible up for discussion among non-clerics. The Catholic Church maintained the only true version of the Bible was the Latin Vulgate, and private interpretations that deviated from Church teachings were dangerous and heretical. The council also rejected the Protestant idea that Scripture alone was enough to bring man to God, adding that traditions preserved by the Church were also a source of authority. The Council of Trent served its purpose of bringing much needed reform to a corrupt and nearly broken Roman Catholic Church. It honed the Church’s structure and doctrine, and defined the organization until Vatican II in the 1960s. It also made the gulf between Protestants and Catholics impossible to bridge. The differences in doctrine were just too deep and fundamental to broker a reunion. Any hopes of turning back the clock abruptly ended with the Council of Trent. No, they did not “prefer” to “reform” the Catholic Church. The Church, being (as the Bible says) the “Body of Christ” (the only Church founded by Jesus) and the spotless “Bride of Christ,” never needs “reform” herself. Rather, it was many of her MEMBERS that needed to “reform” their lives, and it was some of her temporary, manmade structures that needed to be suppressed or replaced. The “Fathers” (pope and bishops) of the Council of Trent performed many of the needed, too-long-neglected, corrective actions. Unfortunately, those who are now called “reformers” (although they were actually new “founders,” each essentially making himself a private “pope”) had already caused far more damage to Christendom than a few centuries of ecclesial neglect (exacerbated by the great plagues) had done. No, it was not “out of hand,” a phrase that implies that just a little such selling would have been OK. The Catholic Church had always forbidden ALL selling of indulgences — because that was part of the apostolic “deposit of the faith” — and the Council simply reiterated that fact. This is not an accurate way of saying what happened, because it implies that the Council adopted some protestant beliefs. Instead, the Council rejected EVERY heretical non-Catholic doctrine, but reiterated every truthful doctrine that the protestants had inherited and chosen to retain. The Council adopted ZERO new teachings, because it is impossible for Christianity to create new and valid doctrines. The author was very unwise to say that the dogma of Transubstantiation teaches that “bread and wine literally are transformed into the body and blood of Jesus Christ.” Using the phrase, “literally are transformed” imples (wrongly) that Catholics have a belief that a chemical change occurs, resulting in human flesh (i.e., something that would taste like raw meat) suddenly appearing on an altar. Catholics and Orthodox believe no such thing! No, no, no! It was impossible for the Catholic [not “Roman Catholic”] Church to “move” toward or away at all — because she is incapable of changing any of her doctrines (of faith and morality). Rather, it was the protestants who moved away from the teachings of Jesus, handed down through his Apostles and their successors, the Catholic (and Orthodox) bishops for almost twenty centuries now. Sadly, many protestants have continued to move away (on faith and/or morality), to a greater and greater extent, some even in our current decade. Great Scott! What ignorance of the facts the above demonstrates! For centuries prior to Luther, Catholic scholars (e.g., St. Bede the Venerable, before the year 1000) had been producing approved “translati[ons of] the Bible [in] the languages of the common man.” Before Luther, there were dozens of translations, in numerous languages. As a changeable disciplinary rule, the Church declared the Latin Vulgate to be the official translation from which vernacular translations should be made — not “the only true version” of the Bible! The problem that had to be addressed by the Council (and subsequent popes) was that protestant vernacular versions (based on old Hebrew, Greek, and Latin versions) always seemed to contain heretical doctrines, due to mistranslated words and phrases. The use of such bad translations by Catholics is what was forbidden. To the above, I must add that the Church was not “nearly broken.” Even in the 1500s, she existed with far fewer problems in some parts of the world — especially in Asia, as far east as India, and in northeast Africa. Moreover, since Jesus had promised “indefectibility” to His Church (i.e., an inability to collapse under the onslaughts of hell), she could not possibly break down and disappear. His Holy Spirit thus guided the Council of Trent to make some of the changes necessary to correct people that had gone astray and some of the manmade structures (e.g., for the training of clergy) that had become very imperfect. This is absolute and utter nonsense, as anyone involved in the ecumenical movement over the last fifty years, knows quite well. The writer should have known better than to put limitations on the Spirit of God, who can help divided Christians to be reunited. During the writer’s lifetime, there have been millions of conversions (“reunions”) of individual protestants who have become (or returned to being) Catholics … and there have even been some mass conversions of nearly entire protestant congregations with their pastors. Hundreds of Anglican clergymen (even the former Bishop of London, England) and many thousands of Anglican laity have become Catholic within the past two decades. Thank you for the opportunity to set the record straight.